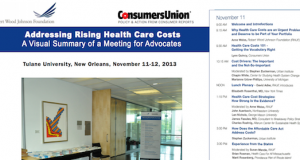 At the November 2013 Working Meeting for Consumer Advocates to address rising healthcare costs, expert speakers offered insight into healthcare cost drivers and potential cost containment strategies and advocates brainstormed how these ideas could relate to their work. The meeting was facilitated by information design specialist David Sibbet, who documented key questions and concepts visually throughout the meeting. This visual conference report includes photographs of Sibbet’s graphic charts as well as photos of the speakers and participant work groups. It provides a valuable and engaging resource for summarizing key concepts and discussions from the meeting.